Not only can you unleash your inner pirate there, but you can also choose between Empress & Mermaid Makeovers for girls, as well as multiple pirate faces or a special Jake and the Never Land Pirates makeover for boys! Its a ton of fun, and a great alternative to the Bippity Boppity Boutique makeovers also offered at Disney. 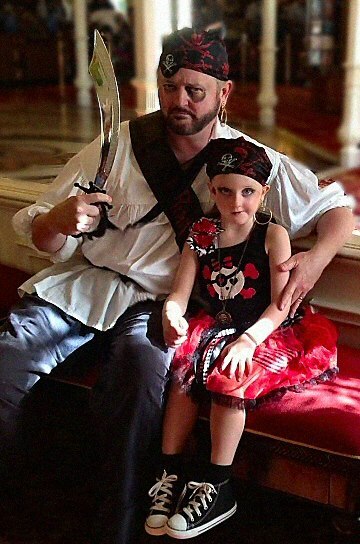 Get all the details and see more photos of our pirate adventures on my wife’s post here ➜ The Pirates League – Disney World Makeovers! That is so cool! We live near the Disneyland Resort and are there often. Looking at all the princess makeovers running around, I was just thinking they need something for the boys to do. Awesome! Thanks Justin, it was a blast. This was a the Magic Kingdom at Disney World. I was just at Disneyland a couple of weeks ago during their halloween celebration, but didn’t notice if they have this option there. Probably. 🙂 Thanks so much for dropping by!